How can we hide the plex vault in the inventory? Its extremely annoying and typically only needed once per month. Cant warp moon closer than 5000km, is that upcoming feature or just a mistake/bug? Stupid f***ing update. Plex is more expensive then ever and Plex scams as nauseum which I predicted weeks ago. Stupid lighting change broke station interiors so now I have to play on direct x 9 with 5fps. I got 11before and I didn't freeze when docking and undocking. Nothing of value added, game just made somewhat worse. Starting to feel very cheap and full of adverts like it's a zynga game or clash of clans. I look forward to cheezy commercials soon. Oh everything group together no ui for me in the game then. Ohhh, i figured it out. I also love the 4 weeks contracts now, this is going to be nice in some ways (i sell a lot on contracts). The fighter related UI changes are also awesome. Blood raider caps/titan sound nice, i hope they will be with a smaller cost than the serpentis ones, which in some ways are more like vanity stuff now. It's good that you made separate brackets for EG's, these things will end up cluttering the skies. Maybe in long term you should decide on a limit of citadels per planet/system. You might also consider making them easier to blow up, the Astra for instance has an obscene exposure (in terms of hours). Maybe buff their defences, increase exposure, reduce cycles of reinforce ? Not a big fan of displaying portrait on structures, i hope you have a way to disable this .... it's more of an e-peen thing i guess. Plex value will go down, there was a lot of speculation with plex right before the update. However, summer is coming, and if the trend is the same, it should go up even more during summer time. It will tank the moment ppl go back to school/jobs. Utility is the Key CCP, something that despite having many masterstrokes in this game in the years I have been playing you guys just cant seem to get your heads around. Utility, the idea that things wherever possible should be simple to use and not time consuming. The new scanner is a dog, I HATE it. Now I freely admit to my being a vet so bitter that i have bitter in my bitter but please.... WHY IS THERE A GIANT GREEN DEATH STAR IN THE MIDDLE OF THE SCANNING MAP? Why is he unhappy? I cant see anything genuis, it makes it really hard to see the things you are trying to scan down. Yes yes directional scan is important and seeing the range displayed is ok for idiots who dont know how to use it without visual aids i suppose but why for gods sake why is it so damn bright? Fearing another wall of text won't do any good, I made a video in regards to the probe scanner / star map changes. It was months overdue, but then again, it should not be my (or our) job to consider this properly. Hope some will take the time and actually address the issues. It's not about the price going up on plex or the fact that plex can no longer be used to do character transfers. For me it is simply that CCP implemented these changes without notifying the Eve community. It was done in a disgustingly sneaky way which has broken the trust I had in CCP. I'm a person that believes in being forthcoming and letting the chips fall where they may. Had CCP been as forthcoming and just gave us notice that these are the new changes to pricing and use of PLEX, I would be ok with it but now I have to act on principal. I have already unsubbed 2 of my 6 accts and I feel that our relationship has come to an end. I remember that summer of rage. I was part of the protest. I remember how CCP admitted to making mistakes and going forward was going to have more open communication with the player base. However, it seems that CCP has fallen back into it's old ways of not caring about how we are affected or treating us with the respect the we, the players, deserve. Simply put, don't bite the hand that feeds you. I have seen the changes that have been implemented over the years concerning CCP's business model for Eve and I can no longer support the actions of CCP. When a company takes actions that even look sneaky or dishonest towards it's player base, then I have reevaluate my continued participation in that business as a customer. I have chosen to vote with my wallet and place my support elsewhere. I have to follow my principals and quite frankly, I no longer trust CCP. Please feel free to contract your belongings to me. ...and they did give heads up on changes to PLEX. just logged and seen the update. 500 plex is what it takes to add game time. They selling you 440 +60 free for 19.99 unfortunately to me this smells, and really bad to boot. I see people calling it a scam, it looks closer to what might be considered something else. To what odor do you refer? Of course this is a "goddamn" comparison because CCP reduced the amount you get but keeps the same price. And as for "what odor" the other guy refers to: You pay 19.99 to get 440 PLEX, not 500. 60 PLEX of these 500 total are supposed to be "free". Funnily enough, CCP has removed that now and says now that you pay 19.99 to get 500 PLEX. Until that correction, it was false and deceiving marketing. Do something against the high CPU usage CCP! CPU usage is 2 - 2.5 times higher since the patch. My laptop is melting. Before the patch i could barely hear the fans when running 4 clients, now the fans run at full speed all the time. Correct on the 60 Free PLEX removal - Now its 13% BONUS??? That's still 60 PLEX "free". It's Still a revaluation on the base PLEX price upwards. Nu-PLEX Costs more than old plex. The 440 base price is the valuation used to set the price for all the packages of multi-buy incentives. 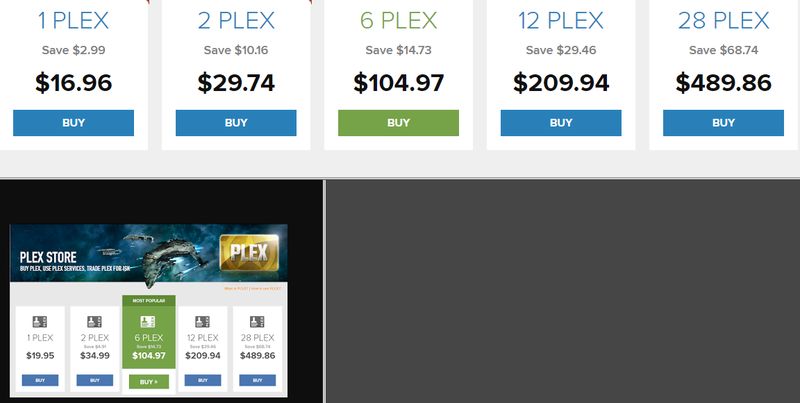 The parity with the old PLEX prices is not matched until $99 package. Therefore, the base PLEX price has gone up. You are correct in that CCP is taking the players for a ride on the inflation short bus. 14 year old game has become more expensive to play this week over last week. As Fozzy would put it, this is just another knob we can use to tweak the system. As long as I can remember, yes. The 13% bonus is compared to the smaller offer you can purchase (which you could't before). That uses the Bonus PLEX in the comparison. The true valuation has increased by inflation to a new normal. You don't realize that the "free" or "bonus" plex is not part of the valuation and don't realize that it's a marketing tool used to establish a new baseline for pricing. Therefore, the new baseline valuation is the tool used to derive the cost of the larger package deals. There is nothing in the rule of corporation pricing that says the Bonus or Free plex is mandatory and can be revoked at any point as it's NOT part of the base valuation of the product being sold - period! It will calm down but the overall prices will be slightly higher than before due to higher demand now that skill extractors can also be purchased via plex. With the new Plex system you need 500 of them to play 30 days - well that's fair enough. TY for that lovely typical troll response about my stuff. You obviously missed the whole point of my post which wasn't about PLEX changes or the removal of using PLEX to pay for character transfers. It was about the way CCP went about it. CCP said years ago that they were going to be more open and communicative with the player base about these changes. They failed, again! While they did give us a heads up on the changes of how PLEX was being broken up into smaller bits, plex vault, they were never forthcoming about how the pricing was going to be done. Keep in mind that the "+ X Free" doesn't count towards the price as that bonus amount can be revoked at anytime by CCP. CCP slipped into the patch notes, 4 days before the patch, that PLEX can no longer be used to pay for character transfers and said nothing concerning this until someone called CCP out on this matter. The excuse CCP gave was pathetic at best. I personally feel that CCP has broken their word and I no longer trust them. I have principals and I'm not the kind of person that says, "thank you sir may I please have another." Maybe you are, but I am not! Why "buy as a gift" option doesn't work?Also if we use the new plex to add time to account seems to work only on account manager and you can't see the added time in game or in api's. I assume is working as intended as always. A few years ago, didn't CCP hire someone from Electronic Arts? I remember reading comments from players worried that Eve will eventually follow the dark path of "gold ammo" and other pay to win offers. Perhaps these Plex changes are the beginning (of the end): confuse the player base further, offer some dynamic deal, offer some small trinkets for sale, and slowly build upon that before the only way to play Eve successfully is to pay to win.